Fonts seem like pretty innocuous little files, and most times they are. But like any computer file, fonts can become damaged or corrupt; when that happens, they can cause problems with documents or applications. If a font won't display correctly, or at all, in a document, the font file may be damaged. If a document won't open, it's possible that one of the fonts used in the document is damaged. You can use Font Book to validate installed fonts, to ensure that the files are safe to use. In addition, you can (and should) validate fonts before you install them, to head off at least some future problems. Validating fonts at installation can't prevent the files from becoming damaged later, but at least, it will help ensure that you're not installing problem files. Font Book is a free application that's included with Mac OS X 10.3 and later. You'll find Font Book at /Applications/Font Book. You can also launch Font Book by clicking the Go menu in the Finder, selecting Applications, and then double-click the Font Book icon. Font Book automatically validates a font when you install it unless you've turned off this option in Font Book's preferences. If you're not sure, click the Font Book menu and select Preferences. There should be a checkmark next to "Validate Fonts Before Installing." To validate a font that's already installed, click the font to select it, and then from the File menu, select Validate Font. The Font Validation window will display any warnings or errors associated with a font. To remove a problem or duplicate font, click the checkbox next to the font, and then click the Remove Checked button. Be careful about removing duplicate fonts, especially if the duplicate is used by a specific app. If you do plan to remove duplicate fonts, make sure you have a backup of your Mac's data before proceeding. If you have a large number of fonts installed, you can save time and validate them all at once, rather than selecting individual fonts or font families. Launch Font Book, then from the Edit menu, choose Select All. Font Book will select all fonts in the Font column. From the File menu, select Validate Fonts, and Font Book will validate all of your installed fonts. Font Book will let you know the results by displaying icons next to each font. A white check mark on a solid green circle means the font appears to be OK. A black exclamation mark on a solid yellow circle means the font is a duplicate. A white "x" in a red circle means there's a serious error and you should delete the font. We recommend deleting fonts with yellow icons, also. 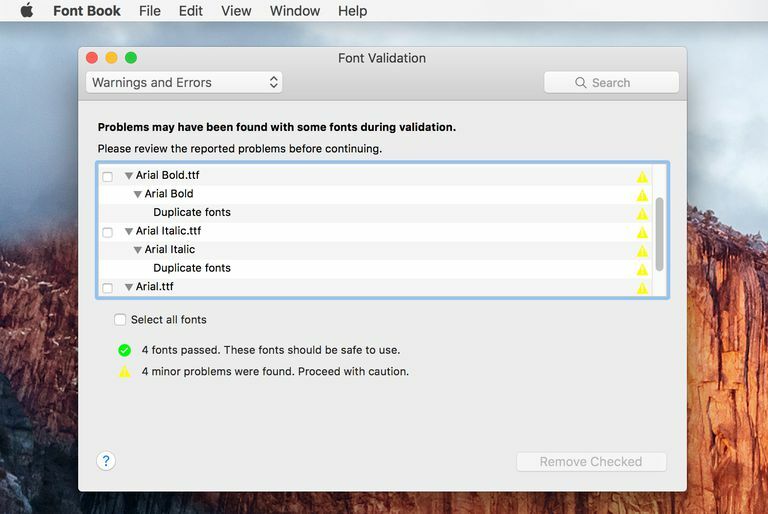 If you have collections of fonts on your Mac that you haven't installed yet, you can wait until you install them to validate them, or you can check them in advance and toss any fonts that Font Book labels as possible problems. Font Book isn't foolproof, but chances are if it says a font is safe to use (or that it possibly has problems), the information is most likely correct. It's better to pass on a font than risk problems down the road. To validate a font file without installing the font, click the File menu and select Validate File. Locate the font on your computer, click once on the font's name to select it, and then click the Open button. You can check fonts individually or check multiple fonts simultaneously. To select multiple fonts, click the first font, hold down the shift key, and then click the last font. If you want to check a large number of fonts, you might, for example, check all the font names that start with the letter "a," then all the font names that start with the letter "b," etc. You can select and validate all of your fonts at once, but it's probably better to work with smaller groups. If nothing else, it's easier to scan through a short list to find and remove marked fonts. After you make your font selection, click the File menu and select Validate Fonts. To remove a problem or duplicate font, click the checkbox next to its name to select it, and then click the Remove Checked button. Repeat the process until you've checked all of your fonts.